Male, 28 years old, and single. Birthday is January 01, 1991. Backseat available. 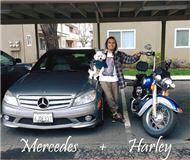 Owns a 2007 Harley-Davidson® Sportster® 883 Low XL 883L. Looking for friends, riding partners, or a relationship. Lives in milpitas, California United States. Member since April 2014.